Conversation with Claus Hetting, CEO & Chairman of Wi-Fi NOW, about the development of Wi-Fi on its own but also related to the telecommunications industry and how both technology could be cooperating further sooner rather than later. However, still some telco agents keep insisting on debating about technology supremacies, which technology will kill what technology. But market movements, such as the new white paper between NGMN and WBA signal that both camps, 3GPP and Wi-Fi, have more to gain if they work together than to lose. It is time to take this debate further and more seriously. Claus Hetting, CEO & Chairman of Wi-Fi NOW events. I've worked in the mobile industry for close to 20 years as a consultant, analyst, and solution architect. I had the great good fortune to work for Nokia Networks for 8 years all over the world - which has taught me all about the mobile industry from the inside. 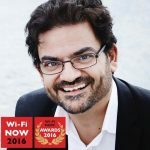 After this I worked as an independent consultant supporting vendors, service providers, banks, industry organizations, and research houses working within the mobile and broader telecoms/IT industries.For the past couple of years I've been focusing on all forms of public Wi-Fi and Wi-Fi offload. I believe public Wi-Fi in all its forms is on the verge of a big breakthrough. My current mission is to support service providers and technology vendors in profiting from all of this. My personal mission is to create the right business environment and community allowing everyone in the industry to benefit from this big shift from traditional mobile to Wi-Fi.